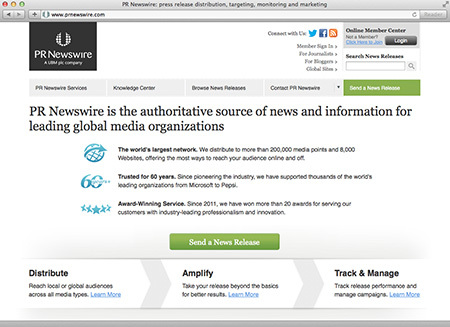 PR Newswire is one of the more popular press release services. First started in 1954 as a local, New York-based company, it is now one of the biggest global media distribution companies. The company was created in order to allow companies from various different industries to be able to communicate directly with the audiences they are trying to reach, from a single, convenient location. Naturally, they deliver this in a modern manner, using online tools to their best advantage. They use all types of different online tools, including multimedia, online video and rich media and these pieces are then distributed through their network, which includes digital, traditional, social and mobile channels. PR Newswire claims that they make it possible for organizations to see their content distributed on a global level, while at the same time being able to measure how effective this is. As such, if an opportunity is there, it can be engaged and this can be done across all the continents. Additionally, they have made sure that their services can be tailored to the specific needs of a company, through different contracts and different distribution services. PR Newswire offers three methods of distribution, which means there is a package out there for everybody. News & content distribution, which allows a press release to reach online journalists and bloggers on a global level. The option is also there to reach international and domestic trade magazines, while ensuring the press release is translated in the correct language. These releases can include videos, photos, logos and other forms of multimedia. Financial distribution, which is designed in such a way that it is fully compliant with all financial rules, including SEC rules. This package is designed for those who have to follow specific regulations in terms of disclosure. All documents can be converted in the right format and the service is designed to ensure specific deadlines are always met and streamlined, including proxy statements. Postings are made on SEC-compliant sites. Additionally, the package includes support from compliance professionals. Event services, which is all about announcing to the press that events are about to take place, ensuring you receive the right media coverage. PR Newswire has excellent customer service both for existing customers and those considering signing up. They have both direct telephone lines and online chat capabilities. Additionally, they have online contact forms that are replied to within 24 hours, as well as dedicated email addresses for specific questions. Through PR Newswire, it is possible to add your own multimedia material and press releases. Additionally, the company is able to analyze these releases through their Releasewatch and Visibility reports. These are designed to demonstrate how effective each release has been. Additionally, a number of different distribution channels, or Newslines, are included. This means it is possible to target based on topics, geography, industry or a combination of these. Furthermore, they have the SearchMax and WebMax systems that allow press releases to be sent to subscribers and specific websites. Full SEO support is also offered, as well as a social media support services. Within the system is a huge contact database, which allows subscribers to send their information to anybody from huge international media conglomerates to opinion formers and small websites. Furthermore, they offer event hosting services, including webinars, conferences and seminars and a range of other types of media outreach events. Finally, they have a huge range of testimonials, downloadable content and various ideas, which allow others to learn about how to create releases and how to best utilize these. As such, it is an opportunity to network for businesses. There are no set timelines for the editorial reviews of any press releases through PR Newswire. Since it may at times be necessary to release something on the same day, it is very important to make sure that you work closely with the company itself to ensure deadlines are met. A lot of review work is done for you, including ensuring you meet all the necessary SEO requirements, and this can take time. PR Newswire has a very strong focus on social media. They have easy sharing buttons to ensure your content is immediately distributed on the different platforms. Their trademarked SocialPost services allows you to put your post straight onto Twitter. Additionally, they have their own presence on Twitter and Facebook and they also have a handy RSS feed button. PR Newswire does not offer any one size fits all solutions. Hence, in order to start with them, you will first have to answer a number of questions, which will allow them to work out which package is most suitable for your needs. This includes working on what your objectives are, who you are trying to reach (in terms of demographics, geographical location, industry and so on), how widely you want your releases to be distributed, how often you will be sending out releases and whether you have any multimedia content that you want to include in your releases (such as videos or images). However, the reported lowest cost by others is $680 and some are mentioning membership fees of $250. The listed guide price for a single press release currently stands at $130, and an example of a higher end release, which includes all possible forms of multimedia stands at $3,750. This does demonstrate the wide variety of packages that are available. There is a worry that the world of press releases had died with the latest Google update, but it seems skeptics spoke too soon. PR Newswire has been a major player in this field since their conception in 1954 and it is believed that they will continue to be a strong player for many more years to come. The service they offer is fully comprehensive, albeit structured in such a way that can confuse people if they are not already a member of the service. Similarly, their pricing structure is slightly veiled and requires membership before finding out how much you will actually cost. According to PR Newswire, this makes their service fairer, but some would suggest it is overly complicated and can make things expensive. Overall, PR Newswire is definitely a company to recommend, not in the least due to their reach of over 80,000 journalists worldwide.